Kara’s unconventional career makes her a perfect fit for the series and her pursuit of a career beyond clinical is another great reason for these interviews - to showcase the diverse areas dietitians can and do work in. I have worked in schools, so I can appreciate Kara’s passion for helping create habits in students. I don’t know if Canada has similar farm to school programs, but it sounds fantastic and I’m glad Kara found her calling/niche in dietetics. I first became interested in food when my dad found out that he had really high cholesterol. Instead of turning right to medications, he explored new foods and ways of eating to take control of his own health. This really peaked my interest in learning more about food and how it plays a role in our lives physically, but also socially, emotionally, environmentally, and even economically. With my new found interest in food I decided I wanted to become a Registered Dietitian. As I began to research schools I could attend to become an RD, all I could find were programs with a heavy emphasis on clinical nutrition. While I was still really interested in nutrition, I decided that maybe being an RD was not for me. I could not see myself working in a hospital setting for the rest of my life. Fast forward two years and I was getting close to completing my bachelor’s degree in Health Promotion when I began to discover the other areas RDs could work in outside of the hospital. I was volunteering for a taste testing program dressed as a bright red tomato in a local school when I fell in love with the mission of farm to school. Farm to school programs empower students and their families to make healthy eating choices that also strengthen their local economies and care for the environment. I loved that schools provided an amazing opportunity to influence our youth’s health before they ended up in the hospital with a preventable disease. After doing some more research and talking to some local RDs, I decided to go to graduate school to complete my original dream of becoming an RD… this time with a new perspective. In graduate school, I quickly became more and more involved with farm to school. It was then that I knew I had found the perfect fit and path to become an RD for me! The majority of my work is community or school nutrition. I work for a governmental agency that oversees federal school nutrition programs. My specific role is the program director for the AmeriCorps Farm to School Program in the state of Wisconsin (you may recall that Stephanie Simms Hodges mentioned AmeriCorps in her interview too!). I wear many hats in my role as the AmeriCorps Farm to School Program Director. My overall job is to help communities all over the state build sustainable and effective farm to school programs by training and providing technical assistance to a team of AmeriCorps members. AmeriCorps is a national service program in which members sign up to serve their local communities by addressing needs such as poverty, hunger, and increasing academic achievement. Members of our program teach students about their food and how to build healthy habits. They also work to improve the school food environment by increasing student access to and acceptance of fresh, local fruits and vegetables. It is my job to teach our members how to deliver evidenced-based nutrition lessons to students in an engaging and interactive way, how to safely plan/prepare taste testing events, how to build/maintain school gardens, how to encourage school food service directors to buy and prepare more local fruits and vegetables, how to work with local farmers, and more. While I miss being the one to teach my own nutrition lessons in the classroom, it is truly rewarding to see the impact our members have on Wisconsin communities from a higher level. The on-the-ground work they do every day is not easy, but the difference they make is 1,000 times worth it. Some of my other tasks include member recruitment, payroll, discipline/conflict management, contract development/management, program evaluation, data collection, and grant reporting and writing. My day-to-day work is somewhat organized into seasons. Every August when our program starts you will find me in my office making a lot of phone calls to new members and processing a lot of paperwork to get them through the AmeriCorps enrollment process. I also spend a lot of time putting together trainings for our 3-day, in-person orientation. The first few months of our program in the fall is always a busy time providing a lot of additional training and technical assistance to our new members as they get settled at their host sites. Each month I offer at least two webinar trainings for our members. Topics include classroom management, nutrition education, school gardens, experiential education, connecting to local farmers, and more. Winter through spring is a busy time of travel for me because I conduct at least one site visit per host site every year. I love this aspect of my job because it allows me to spend time with the students we serve and gives me a chance observe the great work that my members are doing. This is also when I get to meet with the host site team to see how they are tracking toward their goals for the year and offer any assistance they may need in order to reach them. Each spring, I also oversee the host site application process for non-profits to be a part of our program. Once our panel of applicant reviewers have selected our host sites I begin member recruitment for the upcoming year, which takes me to the last season of our program year, summer. Summer is sort of a weird time for me because while one group of members is wrapping up their service years another group is gearing up to kick off the new program year. One of my favorite things about working with an AmeriCorps program is seeing how much my members grow personally and professionally as a result of their service experiences. I love seeing them get jobs after their service in related fields like agriculture education or nutrition! Once August hits again, the cycle starts all over with a new group of ambitious AmeriCorps Farm to School members ready to hit the ground running when school starts. The job I have now is actually my first job as an RD, but my path to getting here started when I was in grad school. After falling in love with farm to school in undergrad, I applied to be a Nutrition Educator for the AmeriCorps Farm to School Program while I was in grad school. I ended up serving two terms as an AmeriCorps member because I loved farm to school so much! Later when I was applying to dietetic internships, I looked for programs that focused on school nutrition and farm to school. Luckily, I ended up being placed at my dream internship with the Sarasota County Schools in Sarasota, Florida. 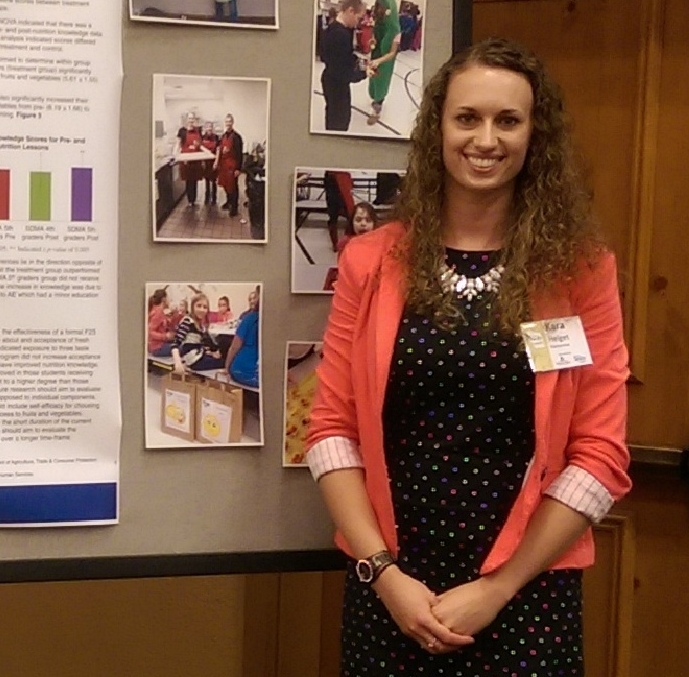 This was and still is the only school district based dietetic internship in the country! Moreover, they had an amazing farm to school program and focus on nutrition education for their students. As soon as I graduated from my dietetic internship, I moved back to Wisconsin to be with my fiancé. Thankfully due to the connections I had made when I served as a Nutrition Educator for the AmeriCorps Farm to School Program, I was able to take on the role of directing the program now as an RD not long after I moved back. Because I decided a little later into my college career to work toward becoming an RD, I decided it was best to finish the Health Promotion degree I was already working on and then go to grad school to complete my DPD (Didactic Programs in Dietetics) coursework and get a Master’s degree in Food and Nutritional Sciences. I’m actually really glad that I have both degrees because I think they both compliment the work I do now really well! Outside of my regular college coursework, I have taken many school nutrition trainings because it is important to understand how their programs work in order to help them make positive changes. Ideally, it would be amazing for all schools to have farm to school programs! To put that into perspective about half of schools (49%) in Wisconsin currently participate in farm to school (42% nationally). What really needs to happen is more support for school nutrition programs ($$!) so that they can afford to pay farmers fair prices for the food they grow. It is also important to support the staff of school nutrition programs because without a reliable team of staff members to prepare school meals everyday it is impossible to provide scratch cooked, healthy meals. I would also love to see more RDs working in school nutrition. It is certainly a challenging field, but I feel that it is so important to support the development of healthy habits from a young age. When you are looking for jobs after your internship or if you looking to get out of your current job, do not be afraid to look for positions that do not require you to be an RD. My position certainly does not require me to be an RD, but I think it adds a lot of value to my role. Instead of just typing dietitian in job search engines, get creative with it! There is SO much that RDs can do and so many areas that we can bring value to outside of the typical RD positions. Networking and building relationships is also extremely important to finding unique jobs in the field. I would not have found the role I have today if it were not for the connections I made during my graduate studies and AmeriCorps service.